I vowed, last year, that I would not suffer another mountain cedar season in San Antonio. And now, I am finally making good on that promise. Let me begin by sharing a little about my history with allergies. Having grown up on the East Coast, I lived in an area where not a lot was ever said about seasonal allergies. Pollen existed of course, but I don’t remember it being followed and reported on. Perhaps it was the time period (1980’s) where we knew a lot less about seasonal allergies compared to today. Or, maybe it was the deep winter freezes our city saw each year that dulled any allergy significance, at least, for me. Fast forward, however, to 2006 and a family move to San Antonio, Texas. Here, mountain cedar was used like a bad four-letter word. Pollen counts were daily and nearly everyone I knew saw an Allergist. Soon, I understood why. After nearly three years living in the Alamo City, not far from the hill country, I noticed seasonal allergy symptoms I had never experienced before. Like so many Texans do, I scheduled a visit with my first-ever Allergist who had me undergo skin testing. I had the whole panel done. Back pricks galore. My results? Negative. Each and every allergen. Not one was positive! I can still remember walking out of the Allergist’s office dumbfounded. I mean, I was suffering. But my skin test proved otherwise. Who was I to question my allergy diagnosis or lack there of one. (Or, so I thought). However, as one could predict, years passed and I was still feeling the symptoms associated with seasonal allergies across Texas: itchy burning eyes, headache, scratchy throat and cough, and once and a while, drainage. Coincidentally, I began working with Dr. Patricia Dinger, Board Certified Allergist and Founder of Advanced Allergy, Asthma, and Immunology, managing Dr. Dinger’s public relations. I blogged on allergies, interviewed patients about them, and posted on social media about the seasonal pollen. The more I learned the more I suspected my initial self-diagnosis of being allergic to something, perhaps many things, measurable in the air. It seemed the more time I spent in San Antonio, the more miserable I felt. Feeling such, I became a die-hard follower of Dr. Dinger’s recommended over-the-counter allergy medication to treat my symptoms. On a near daily basis, I took my big three, as I called them: Flonase, Xyzal, and Zaditor. In addition, I was following the pollen count and mentally journaling when I wasn’t feeling well, even while taking OTC meds. This noting of my symptoms helped me a lot, by the way, especially during last winter’s mountain cedar season. It was a particularly bad one for me and I vowed to Dr. Dinger that I would get tested in preparation for possible treatment the following year. So, in, out, and around my hectic schedule, I finally scheduled an appointment with Dr. Dinger. My new journey a second time around with suspected allergies would, like years before, begin with comprehensive allergy testing and a real good look at my medical history with suspected allergies with Dr. Dinger’s allergy team. So, this September, two months prior to the onset of mountain cedar season I was tested for everything seasonal. It is important to note too, that prior to testing, I refrained from taking my over-the-counter allergy meds the seven days prior to allergy testing according to Dr. Dinger. She instructs patients not take Benadryl three days before testing. There I lay at Dr. Dinger’s comfortable clinic, back exposed, numbered, and ready to be skin-scratched with the fiercest of my suspected allergens. In an area offset by a positive histamine test to act as a control, a small plastic tool gently scratched each area. I didn’t feel a thing. 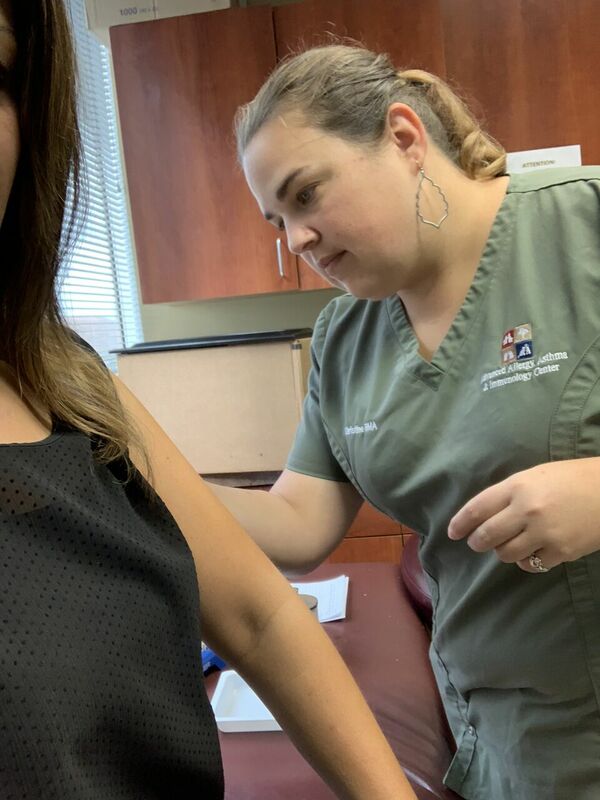 Dr. Dinger’s medical assistant prepped me in saying that some people experience slight discomfort along certain areas of the back, however I felt nothing. It was simple. Painless. Then, I waited. Laughably, I was excited. I would finally learn if I was allergic to allergens commonly found in Texas, households, and even carried on my pet dog. As I waited, I felt a slight bit of itching. “Itching can indicate a positive reaction,” Dr. Dinger told me, as she checked in on my progress. Meantime, the area surrounding where I was pricked with the control histamine grew. That’s a good sign that the test is working. But the test site it was not the only area to react. Certain spots were also growing in size. Dr. Dinger noted the changes, and, a short time later, each area was measured. A measurement greater than 2 indicates a positive. In all, at least ten of my test areas looked to be positive. Out of seventy-some allergens tested, however, that left a lot of allergens that appeared to be negative. Because of my high clinical suspicion with a few particular allergens, especially oak, Dr. Dinger felt I needed to have intra-dermal testing done to confirm the scratch test. 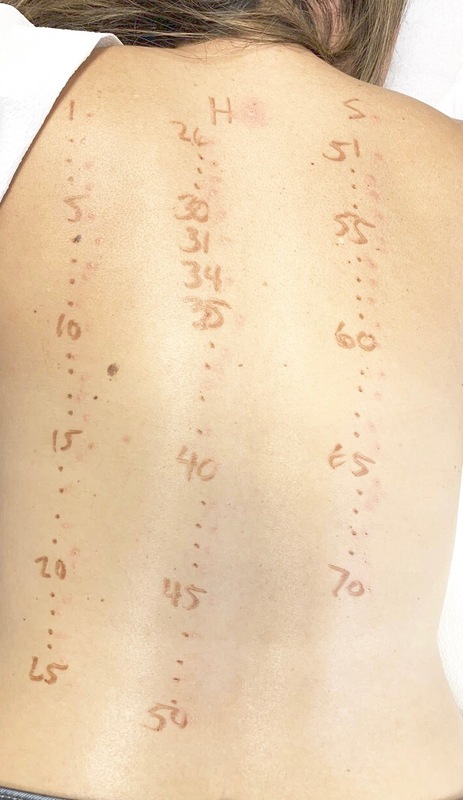 “If I have a patient with high clinical suspicion of allergies and the scratch test is negative I don’t feel it is a complete test unless intra-dermal testing is done,” said Dr. Dinger. She estimated in such cases the intra-dermal test will come back positive for those suspected allergens roughly nine out of ten times. So here I went with intra-dermal testing. Dr. Dinger’s team once again marked my skin – this time my arm where I’d be receiving an injection for each allergen. Intra-dermal testing reminded me a lot of having a TB test done. It was both brief and painless. In my case, the allergens tested with intra-dermal, including a suspected oak allergy, were still negative. This meant I was not allergic to live oak, after all. All these years I had guessed (incorrectly) that I was allergic. I had even been taking over-the-counter medicine for it! Therein, with the intra-dermal and scratch test results complete, I finally had my long-sought-after answer: I did, in fact, suffer from seasonal allergies. They included mold, mountain cedar, ragweed, dog, cat, horse, oak, cockroach, feather, and dust mite. My allergy suspicions were confirmed with a few surprises thrown in (horse)! My many uncomfortable symptoms felt last year during mountain cedar season were, as suspected, an allergic reaction to cedar! The pressure I would so often feel around my eyes and head on warm days or following rain were due to mold allergy! I felt, in a way, relieved. I wasn’t crazy. I wasn’t imagining my symptoms. And I would no longer guess when and why I need allergy medication to manage symptoms. I began to feel empowered with this new information. I now had medically backed proof of my allergies and with that, choices on how to move forward with treatment. Dr. Dinger and Marlena, Dr. Dinger’s Nurse Practitioner, detailed my options for treatment. One option was that I could continue solely with over-the-counter medication. “That’s kind of like treating your allergies with a bandaid,” said Dr. Dinger. Another option? Allergy shots. 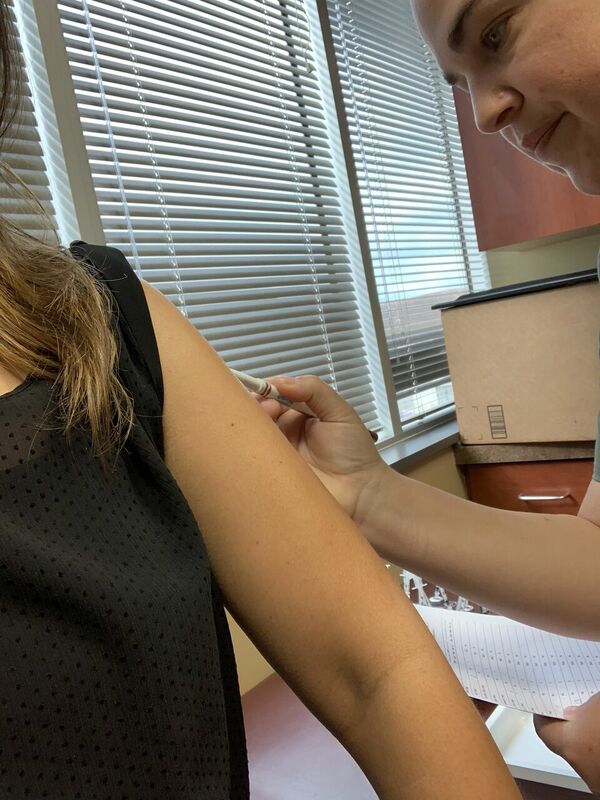 Marlena indicated I was a strong candidate for allergy shots because of the various allergens to which I tested positive, including year-round culprits such as mold, dog, and dust mite. Plus, mountain cedar showed up as one of my allergens and that’s a big one in San Antonio which wreaked havoc upon my day to day well-being last year. Allergy shots, or, allergen immunotherapy, is a form of long-term treatment that decreases symptoms for many people. Shots are effective with treating allergic rhinitis, allergic asthma, conjunctivitis, or stinging insect allergy. They work by decreasing sensitivity to allergens, a lot like a vaccine. Our bodies respond to injected amounts of a particular allergen (in my case allergens), given in gradually increasing doses by developing a tolerance to the allergen. “Allergy shots are the closest thing we have to a cure for seasonal allergies,” said Dr. Dinger. I did not need my arm twisted. I was well familiar that most people on allergy shots see an 80 percent reduction in their symptoms. Some people reportedly still find they need to take over-the-counter medicine in combination with allergy shots for a desired relief level. 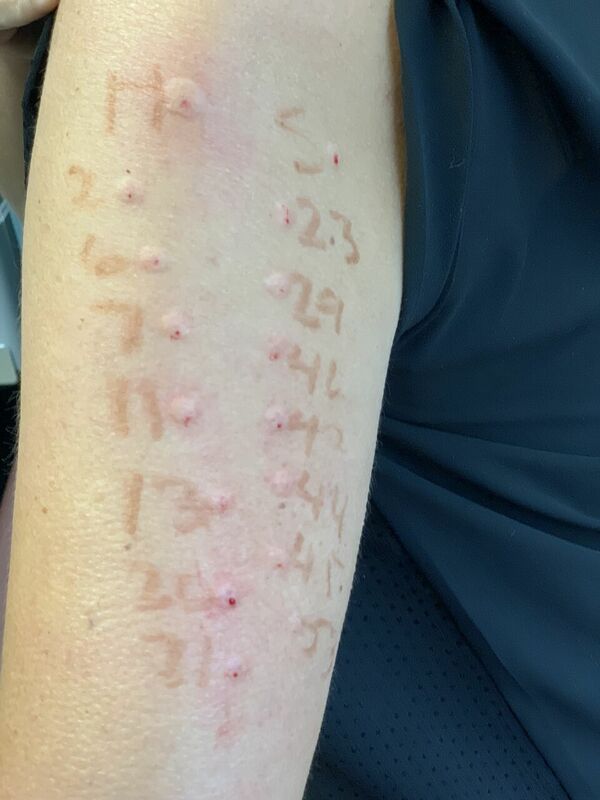 But many patients have reported to Dr. Dinger and Marlena that they were able to stop over the counter medication for allergies after being on shots for a year or two. That possibility, to me, sounded like bliss. The idea of not feeling miserable was a treatment plan I could be on board with. In addition, most insurances cover allergy shots when a patient is diligent with receiving them. The only possible downside to allergy shots that I could foresee, for me, was the planning and commitment shots would require of me. Already stretched so thin as a busy mom of three who works and whose husband travels often, to schedule daily, weekly, and then monthly regular trips to the Allergy clinic would take effort on my part. It would take discipline. It would take advance planning. It would take self-love. To be honest, it has been some time since I allowed myself to put my needs towards the top of what is important in life. This has included my health needs, at times. I understand, however, that a healthier me – is a better me. I know that the better I feel, the more productive I can be. My well-being, I reminded myself, affects my family life, work life, and more. It is that important. With that conclusion, I made the decision, this fall, to begin allergy shots. Due to the close proximity to mountain cedar season and the typical length of time it takes to build up to a dose where my body can have a good tolerance to my allergens, I would do what’s called an allergy “rush”, an option offered at Advanced Allergy, Asthma, and Immunology – but not all practices. A rush involves building up to that working dose that decreases symptoms – faster. There are options between full-day and half-day rushes or a combination of both. Decidedly, I would rush with a combination of two full-day rushes scheduled one week apart. And, I couldn’t wait to begin. Solidly penciled into my busy schedule, I blocked off time to begin a treatment packed with newfound hope. 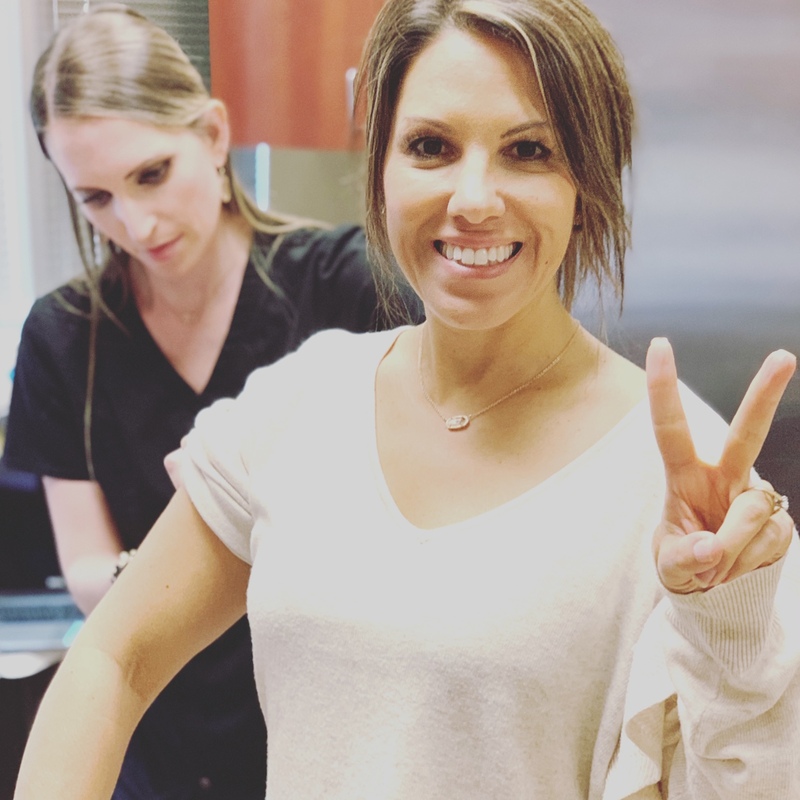 Within just a few short months, just in time for the busy winter holiday season, I should feel strong, healthy, and good, not miserable – no matter how much mountain cedar fills the South Texas air. Follow Erin’s experience with Allergy Rush in an upcoming blog on www.mysaallergist.com or on Dr. Dinger’s Facebook and Instagram pages.